Bunk Double bed-in-wardrobe Horizontal with two beds Spacesaver Folding wall bed-in-wardrobe. The image depicts the console with double bed lower open you can open just the upper bed, leaving under free space to use. Opening folding, lightweight and safe, activated by hydraulic pistons for each bed post closure of the bed complete with sheets and blankets, mattresses use of up to 200cm long supplied the ladder and protection. Folding bunk bed , as the ideal bed in hotel rooms, fast convertable (sprint) in two comfortable beds. Excellent bed-saving retractable , integrated into children's bedrooms for daily use or for the guest. Console bunk bed , wall folding , made of plywood including bed bases. Without mechanisms damageable, with pistons for opening and closing folding , which is very light for both beds. 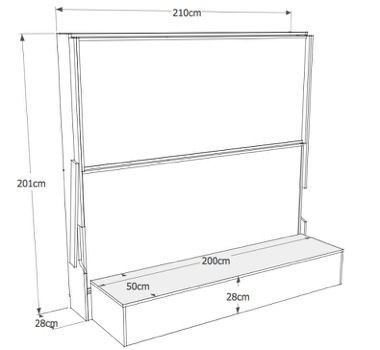 Lower shelf desk use, protection and ladder included. Trasformabile letto a scomparsa con letti a castello, chiudibili con lenzuola e coperte (letto fatto). Depth a letti chiusi di soli 29cm. Materassi extralunghi fino a 200cm. Apertura anche del solo upper bed o inferiore, disponibile anche con letto a soppalco. Changeable both in width and Height, Depth of the bed is only 29cm. upon request, folding shelf, and insertion of latches.